According to schedule set for The JAS June Experience, there will be 4 incredible nights of concerts from world-class musicians at the Benedict Music Tent (June 19-21 and 28), even more this year can be expected at JAS Cafe Downstairs @ the Nell Series, and a FREE Nightly Lawn Party on the Music Festival Grounds with food vendors, bars, and two live music stages. Take a look at the flyer, following the June Experience schedule below, for both the Summer and Labor Day Events....AMAZING! Troy "Trombone Shorty" Andrews has God-given talent, natural charisma and a relentless drive to bridge music's past and future. His latest album, Say That to Say This, sounds like nothing else out there, as Andrews and his longtime band, Orleans Avenue - guitarist Pete Murano, bassist Mike Ballard and drummer Joey Peebles - continue their natural musical evolution. In a very real sense, the torch is passed from one great New Orleans band to another on the album, which features the first new studio recording from the original members of the legendary Meters in 36 years, as they revisit their 1977 classic "Be My Lady," with Andrews singing lead and playing horns. Good things continue to happen for Trombone Shorty, thanks to his virtuosity, his dedication, and his ability to move people. That he pursues his passion with such humility and unpretentiousness makes his still-unfolding story as compelling as the music he's making along the way. Formed in 2008, Red Baraat is a pioneering eight-piece band from Brooklyn, New York. Conceived by Sunny Jain, the group has drawn worldwide praise for its singular sound - a merging of hard driving North Indian bhangra rhythms with elements of jazz, go-go, brass funk, and hip hop. Created with no less a purposeful agenda than manifesting joy and unity in all people, Red Baraat's spirit is worn brightly on its sweaty and hard-worked sleeve. And is being returned to them in cities all over the world, as word spreads of the band's incredibly powerful live performances. John Boutte's job is to sing - to sing jazz, to sing it with such style and grace that no one ever mistakes him for anything other than a master of New Orleans sounds. He is equally known for his extraordinary versatility, embracing diverse genres from R&B and Latin, to deep gospel and soul. Growing up, Boutte was awakened by the sounds of his New Orleans neighborhood. Voices carried over the fence from the Church behind his home in the Seventh Ward, the home where his mother Gloria still lives, where most of his Creole family still lives and sings. Past the front yard, second-line parades rolled by, matching the madness of Carnival season and the transcendent joy of the jazz funeral. This roux of influences created John Boutte, and serves him to this day. He is one of those remarkable cases where the art arises from the true heart. Diana Krall is a three time GRAMMY and eight time JUNO award winning artist. She has sold more than 6 million albums in the USA and over 15 million worldwide. Born in Nanaimo, BC, Canada, to a musical family, Krall's career began in 1993 with the independent Canadian release of her debut album Stepping Out. She released three more independent albums and then in 1999 signed with Verve who released Krall's 5th record When I Look in Your Eyes, garnering her a GRAMMY for Best Jazz Vocal. In 2002, The Look of Love was released and became a #1 bestseller in the US and a five-time platinum album in Canada. 2004's The Girl in the Other Room, was her first focus on her own song-writing; 2005's Christmas Songs proved one of the season's best sellers; and 2006's From This Moment On was an upbeat, critical success. In 2007 The Very Best of Diana Krall was released followed up by the 'intimate, romantic album' Quiet Nights in 2009. Her latest release is 2012's Glad Rag Doll. Selina Albright is an R&B vocalist and songwriter with versatility that comes from years of listening to many genres and languages of music. Her soulfulness and angelic tone add character and emotion to any ballad, yet her powerful wailing and stage presence commands instant attention. 2012/13 truly marked the launch of Selina's solo career. Her debut EP, "Brighter," was released with critical acclaim. She spent most of the year on tour nationally as the featured guest vocalist with Brian Culbertson's band performing at some of the world's most high profile Jazz Festivals and Theaters. For more than four decades, Steve Winwood has remained a primary figure in rock 'n' roll, a respected innovator who has helped to create some of the genre's most celebrated achievements. Winwood burst into prominence in 1963 with the Spencer Davis Group and since that time his celebrated skills as a composer, vocalist, and multi-instrumentalist have developed an impressive catalog of popular music. It should come as no surprise to learn that many honors have been bestowed on Winwood. He is a recipient of the Ivor Novello Outstanding Song Collection and the Musicians Union Classic Rock Award - honors both voted for by his peers. He has also received an honorary Doctorate Degree in Music from Berkeley College of Music, as well as a second Doctorate from Ashton University in his hometown of Birmingham, England. While rightfully acknowledged for his many achievements, Winwood forges ahead undaunted, continuing to create and perform new and exciting material. For nearly 30 years, GRAMMY award winning artist Terrance Simien, 8th generation Louisiana Creole has been shattering the myths about what his indigenous Zydeco roots music is and is not. Leading his Zydeco Experience Band, Simien has become one of the most respected and accomplished artist in American roots music today. He and his band mates have performed over 7,000 concerts, touring millions of miles to over 45 countries during their eventful career. Simien is blessed with an extraordinary talent that expresses the deepest human emotions through the original instrument: the Voice. He takes his audiences on a multicultural tour of the world creating a hypnotic blend of New Orleans funk-reggae-flavored-world-blues-American zydeco roots music that beckons you to your feet and into the groove. "Gratitude and joy, gruffness and beauty balance each other perfectly in singing that has grown more rhythmically acute with each passing year." - The New York Times. His initial successes came via a string of Columbia singles in the early 1950'x, including such chart-toppers as "Because of Your," "Rags to Riches," and a remake of Hank Williams' "Cold, Cold Heart." He had 24 songs in the Top 40, including: "I Wanna Be Around," "The Good Life," "Who Can I Turn To (When Nobody Needs Me)?" and his signature song, "I Left My Heart in San Francisco," which garnered him the first two of his 17 Grammy Awards. Tony Bennett is one of only a handful of artists to have new albums charting in the 50s, 60s, 70s, 80s and 90s and 10s. He introduced a multitude of songs into the Great American Songbook that have since become pop music classics. 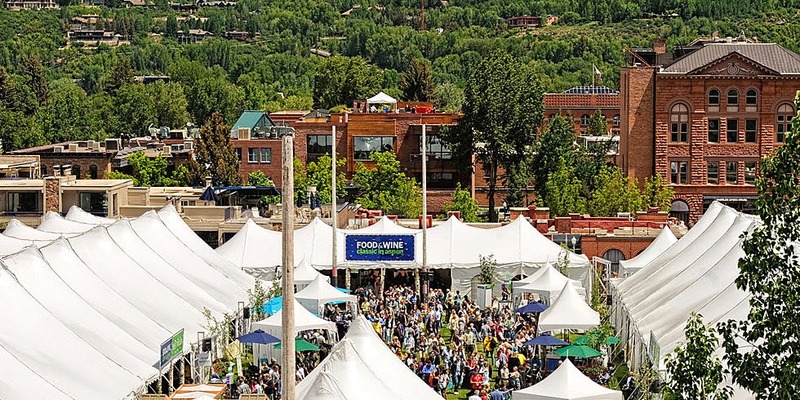 FOOD & WINE Magazine presents its 32nd Food & Wine Classic in Aspen. 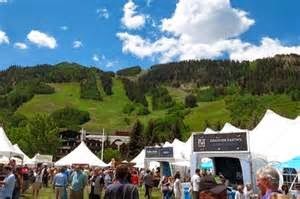 This is an annual weekend of cooking demonstrations, food samplings and wine tastings - all in the spectacular setting of Aspen, Colorado. You'll see some of the world's most famous chefs...including many of those we all see and love on the food network channels, Giada deLaurentis, Tyler Florence, Michael Symon, Jeffrey Zakarian...and many, many more! 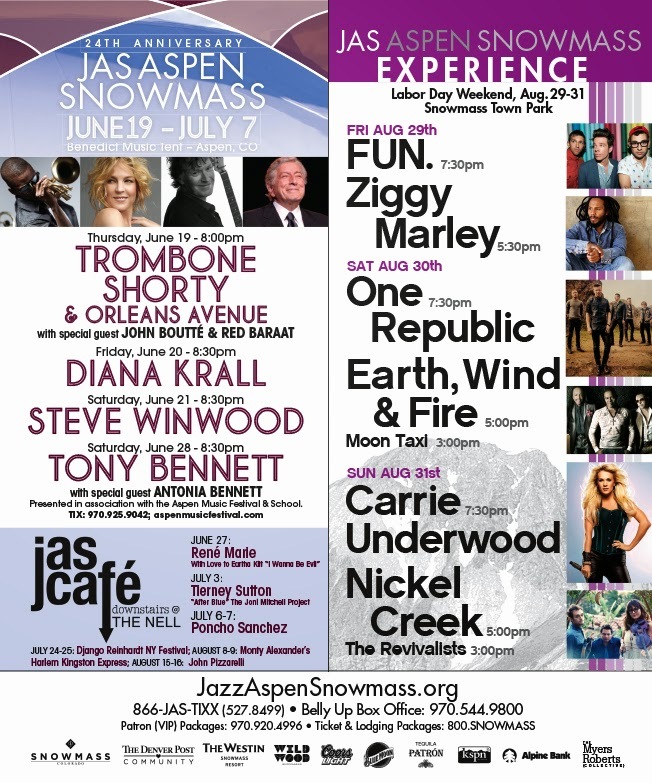 Aspen is a spectacular backdrop for all the white cooking demo and wine tasting tents that will be placed around town! The FOOD & WINE Classic never fails to draw the most talented chefs and wine experts from all over the country, but this year we’re exceptionally thrilled to have such an accomplished group coming to Aspen. From French cooking legends to Master Sommeliers to up-and-coming tastemakers and trendsetters, the Classic talent can teach attendees everything about food, wine and everything in between. Aside from seminars and Grand Tastings, there were plenty of activities happening all weekend to keep even the most energetic guests busy. On Friday morning chefs, locals and Classic attendees set out on a 5K run through the streets of Aspen to benefit a local charity. HEADS UP to all of you who plan to come up for the USA Pro Challenge .... dates set in Aspen/Snowmass for August 18-19, 2014. 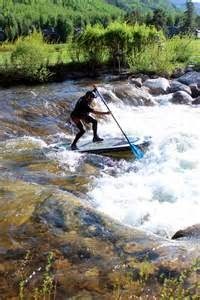 Stage One will take place Monday, August 18 with a circuit race between Aspen and Snowmas, finishing on Main Street in Aspen. 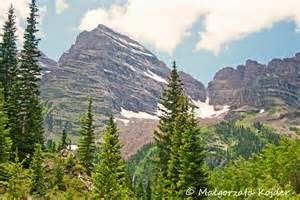 Stage Two will depart Aspen on Tuesday, August 19 and head west on Hwy. 82 to Crested Butte. 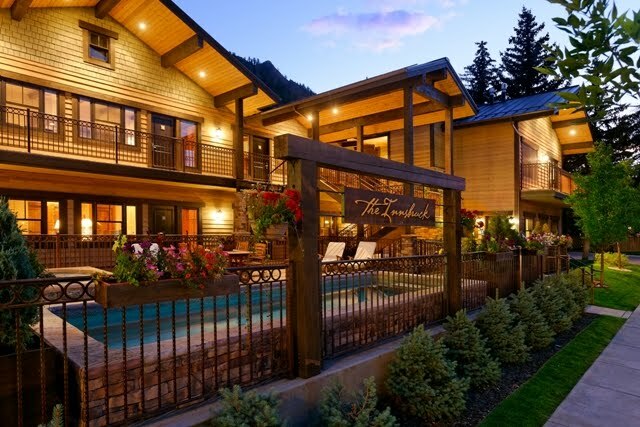 so come join us and relax.....it's Aspen!